I have to admit I´ve been back from the Philippines (Cebu, Bohol, Siargao) for two weeks now and I haven´t done a lot of productive things since then. But I´m slowly back on track, with traveling plans always in the back of my mind. I also haven´t look at a computer screen for a month, so getting my eyes used to that was not easy. I know one month is not a lot, but still going from running around barefoot and being outside all day, to spending 8h in the office behind 2 screens is not easy. But at least it pushed me to ask my boss if I can work 30h from now on and I also gave a lot of project to others and the world didn´t not end :) Now I can´t wait to be able to eat my lunch at home, focus on things I like, travel more and focus more on bringing you more regular content. Well, this was my little life update. Now lets jump for a bit to this beautiful island Siargao. There is no doubt that tourism has two sides. On one side, it puts this beautiful place on the map, enables development and growth for the local population, on the other, the exposure often leads to over pollution, damage of the ecosystem and ultimately, the ruin of the community. 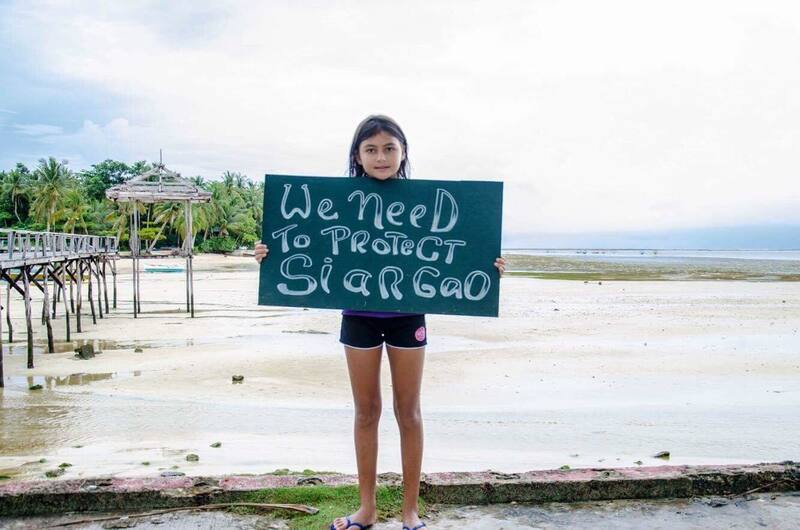 I was overwhelmed with a sense of both excitement and concern during my visit to Siargao. The island is known as the surfing capital of the Philippines with its famous break called Cloud 9. And that doesn´t stand just for Siargao, Philippines, but for any country and place that is still developing and that doesn´t have the infrastructure, waste management, recycling,… I said this so many times also for my bellowed island Hvar, where the same as on Siargao, recycling is jet to be figured out and every piece of trash that comes to the island stays on the island and either enters the sea, gets burned or piles up on the island’s landfill. And this is what island can´t handle, nor survive for a very long time. The tourism was slowly booming already when we were there. There was more cars, people, and trash every week. Small, surf island was getting filled with people taking photos and not caring if they destroy nature, put animals in danger or leave rash behind on every spot. While the caption under their Instagram photo goes something like “Loving this beautiful island”. When you are packing for your holidays please leave all disposable items at home. Anything that might end up in the trash and on this beautiful island long after you are gone. And if you do bring some disposable items, please bring it back home with you. Pack eco-friendly and reusable items. For instance, I packed a shampoo bar, cotton bags, purifying Grayl water bottle, reusable coffee mug, metal straw, wooden chopsticks, wooden spoon, cotton cloth, …. so everything I could think of I might need, just so I could avoid as much plastic as possible. You can see my toiletry kit right here. Once you started really paying attention you will notice how much plastic there really is. Everything is packed in plastic, with few grams of salt, oil, spices and even garlic. For some reason, they also sell shampoo, dishwashing detergent, … in small packaging. Something like the testers the brands offer. If you pay attention and think if there is a way to avoid buying that plastic, you will see that there is almost always a way. For instance, I wanted to bring my friend lunch home, so asked in carinderia (street restaurant) if they could put food in a bowl (hard plastic reusable one) and they trusted me and filled up the bowl. Their idea of takeaway is basically a plastic bag. They just pour whatever you order in a small plastic bag. The rice in one bag, vegetables in other …. If you have an option you can also bring your own reusable box. When ordering any takeaway drinks like smoothies, juices, … they will come in a plastic with a lid and a straw (breaks my heart when I see that). But if you sit down, they will serve it in a glass instead of plastic. I think that since you are on holidays there is no need for takeaway drinks. Sit down relax and drink your smoothie, coffee, … in a bar/restaurant and not on the beach. Plastic doesn´t belong there. 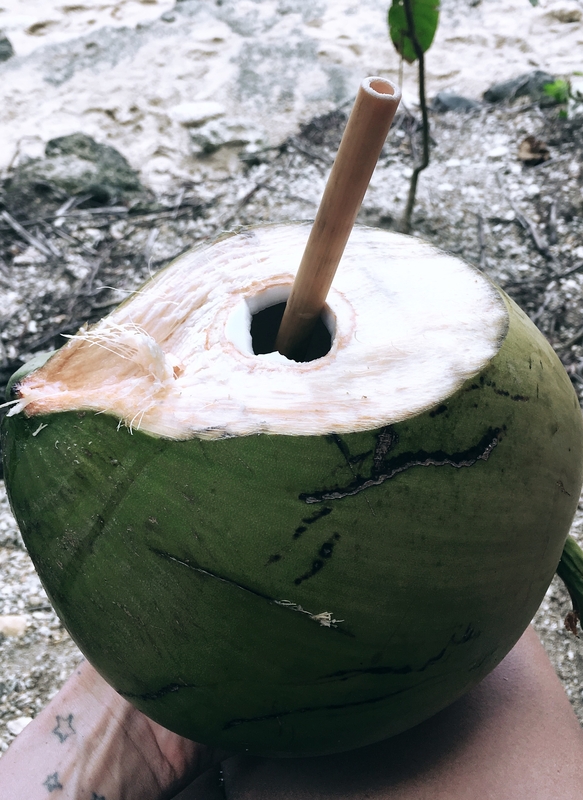 When you order any drink or a coconut, just say “no straw please“. Let them know people don´t want them. You can buy bamboo straws for 15 pesos (0,20€) in local souvenir shops, or bring a metal/glass one with you on the trip. Always carry a reusable shopping bag. If you will rent a motorbike, just put a bag or two under the seat so you will always have one with you if you decide to go to the market. There are a lot of water refill stations on the island. You can refill your reusable water bottle in restaurants, bars, resorts. But if you don´t trust that water or you will be traveling into remote places, you can bring purifying water bottle with you. I bought Grayl bottle and it´s one of the best things I brought on this trip. Just please, please don´t buy 5 plastic bottles every day and leave them on the beach when you go surfing. If you do buy a plastic bottle you are responsible for it, so please put it in a bin for plastic. There are even special bins on the beach only for plastic bottles. This organization Plastic Battle aims to reduce or eliminate single-use plastic bottles at the source by engaging w/ business establishment to provide people the option to refill. You can find a map of all refill locations right here. Please make an effort and put all your trash in the right bin. There are bins for plastic bottles, other recyclables (plastic, paper, metal), and bins for mixed trash. Also please separate your trash at home and put it in the right bin. The island doesn´t have any recycling right now, but they will soon get a shredding machine. You can bring clean, soft plastic to Biboy´s Art studio. He is collecting soft plastic, from any food packaging and so on. He cuts the plastic by hands into small pieces and uses those to fill the empty pillows and bean bags. Visit his art studio if you are passing by. If you are going to go surfing or just for a walk on the beach, you will definitely come across some plastic. Take a bag with you, or grab one that is probably lying around and clean up the plastic so it´s not being washed into the sea. 10 minutes of your time can have a big impact. If you don´t have a bag, it will help if you just move the plastic bottles and other trash away from the sea. Who knows maybe others will see you and join you, or at least think about it and notice the plastic on the beach. 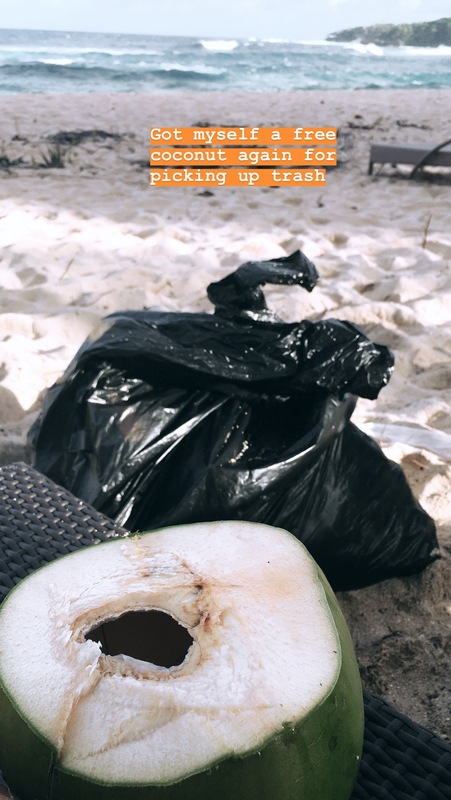 While I was picking up plastic on the photo below, an older man came to me and we started talking about the island and problems, solutions, history, life,.. There was also a man picking up coconuts from the palm trees on the resort’s beach and he gave me a fresh coconut. Somebody also said “Thank you for doing this.” while he was just wandering around the beach. Who knows, maybe ext day he picked up some plastic as well. But if you wanna help out and meet some amazing kids while doing that, you can join one of the weekly beach cleanups. You can find all the info on their FB pages S.E.A. 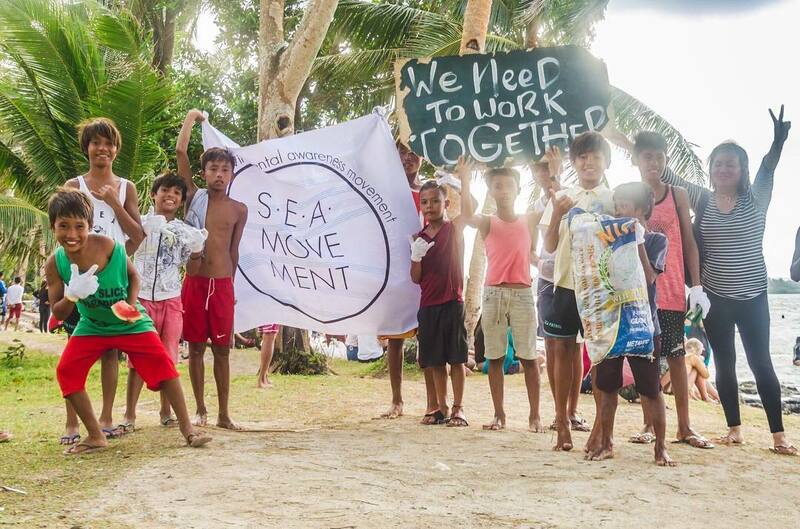 Movement on FB,Gromnationsiargao, Thesuncrew. They need your help, the island needs your help. And this is a great way to give back. Here are some great local organizations that will be more than happy if you decide to give them a hand. You can of course also support them with a donation. 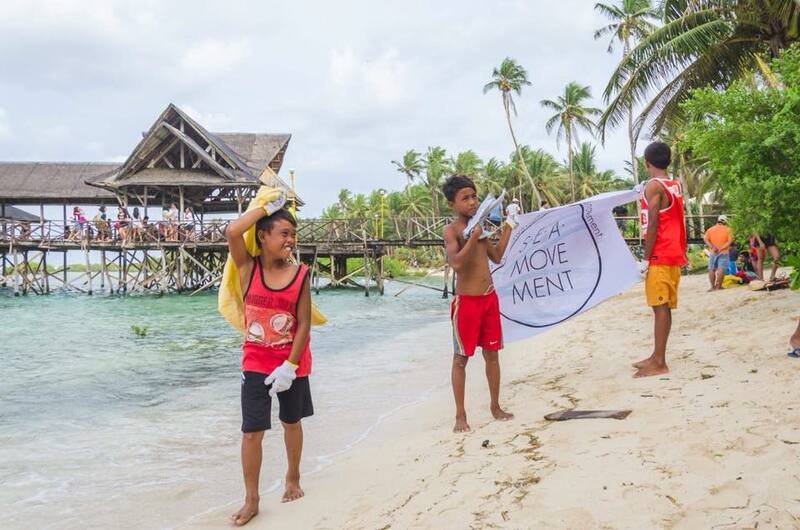 All these groups want nothing but help the local community, preserve Siargao’s beauty and improve the lives of the local people. Using surfing as a mechanism of engagement for kids to participate in programs that they run, such as beach cleanups, surfboard repair workshops and woodwork/construction classes, afternoon homework help, before school breakfast club and much more. You can rent out donated surfboards and get surf lessons by them. All the money they make goes back into the community through resources for education, water filters and mosquito nets for families, local health clinics etc. Their goal is to have enough lessons and funds to decrease the prevalence of poverty on the island by providing families with sustainable sources of income. They are trying to create long-term solutions to poverty by improving school attendance and giving children the skills and opportunities that will help them build better futures. They are also trying to ensure that children play a key role in preserving their island and in improving their local community. And they are doing a great job. Find them on Facebook or Instagram and help them out in any way that you can. is a collaboration individual and/or groups who want to help preserve the natural resources and beauty of the island which the local and the travelling community rely on for an epic life. We work to alleviate poverty and build brighter futures for the local children. 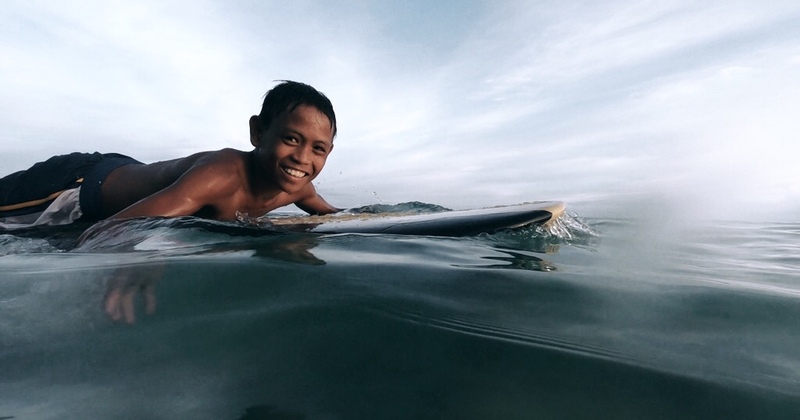 We do this by providing free surf lessons and board use in exchange for children attending school and participating in our education, sustainability and skills programs. Our aim is to ensure the children have the skills and opportunities to overcome poverty and play a key role in protecting their island and local communities. 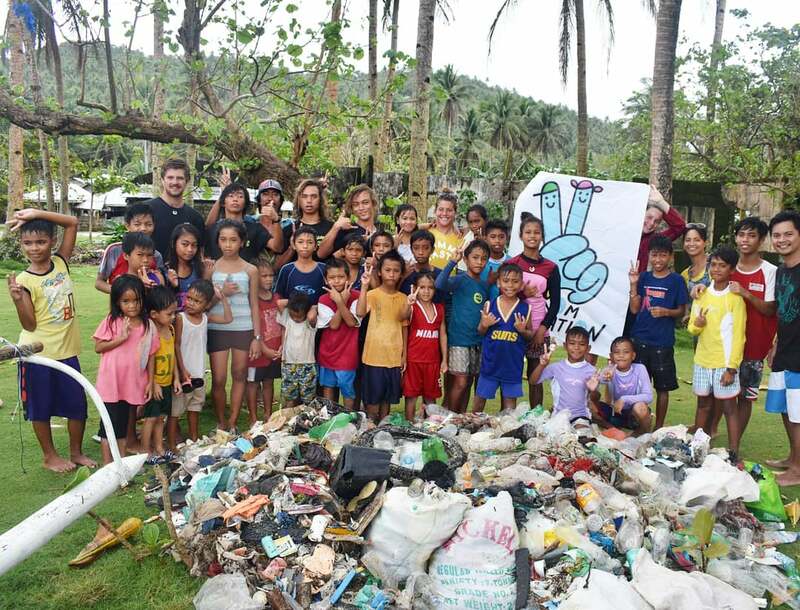 Harana is a local resort that organizes different volunteer tours. From planting trees, helping build houses, reading with kids … Visit their page haranasurf.com and let them know if you are interested in helping out. Common chemical sunscreen ingredients in sunscreen, can kill coral and damage coral reefs. The common ingredient, oxybenzone, kills coral and causes DNA damage. This prevents coral in its larval stage from reaching adulthood. Oxybenzone traps it in its own skeleton, making it unable to float within currents for distribution. Oxybenzone is also linked to coral bleaching, wherein corals expel the colorful algae living inside them. This leaves the bleached-looking exoskeleton behind and ultimately leads to coral-reef death. Luckily on Siargao one of the most common sunscreens is this one from Human nature. 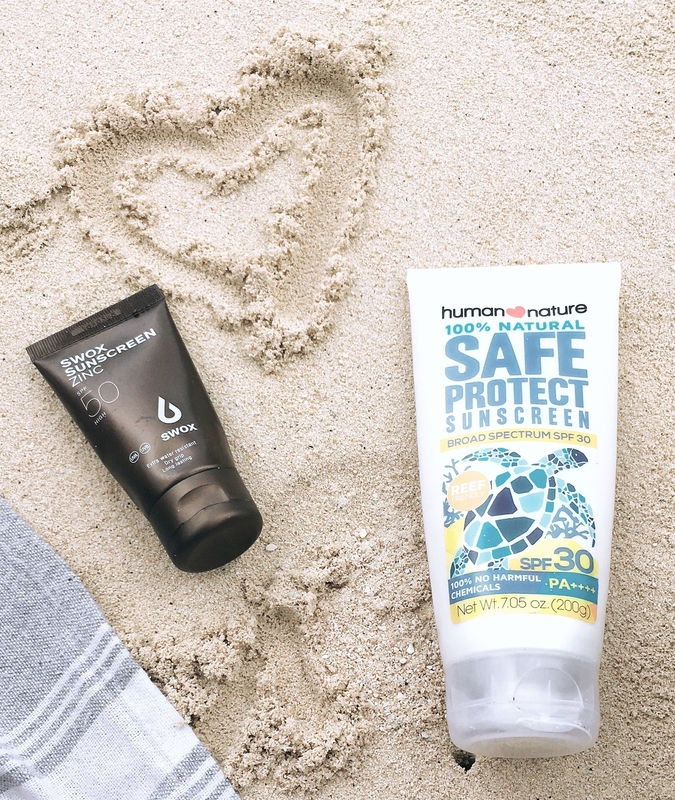 But if you will bring some with you opt for SPF lotions and creams instead of sprays, which are more likely to stick to the sand than your skin. And what we learned the hard way is that everyone should own at least one long-sleeved sun shirt or rash guard to wear for surfing, snorkeling, boat rides…. This way you will use less cream and stay protected for many hours. monthly community market is a zero plastic market in which locals can sell goods produced, grown, and/or made in Siargao. Unfortunately, we missed it, but I believe this is definitely worth visiting and supporting. If you care, please check also if a resort you are staying in cares about the environment. If they are running their business eco-friendly. And this doesn’t mean you need to stay in some hippie place, Eco-tourism is being practiced by some of the most luxurious resorts and hotels in the world. And don´t forget that for you this is only a holiday location, but for somebody else this is home. This is the place where they lived before the first tourist came, where they will raise their children, grow their food. And we should show nothing but respect for their land and lives. Take photos only if it´s appropriate and rather take time to connect with locals and learn about their lives. They are definitely one of the nicest and happiest people I´ve ever met and they are not a sightseeing object. So talk, connect, support and help out the locals. I promise you that it will stay in your heart a lot longer than that must-see location. I know that chances are small that somebody will read this that is planning (or already is) on this small Siargao island in the Philippines. 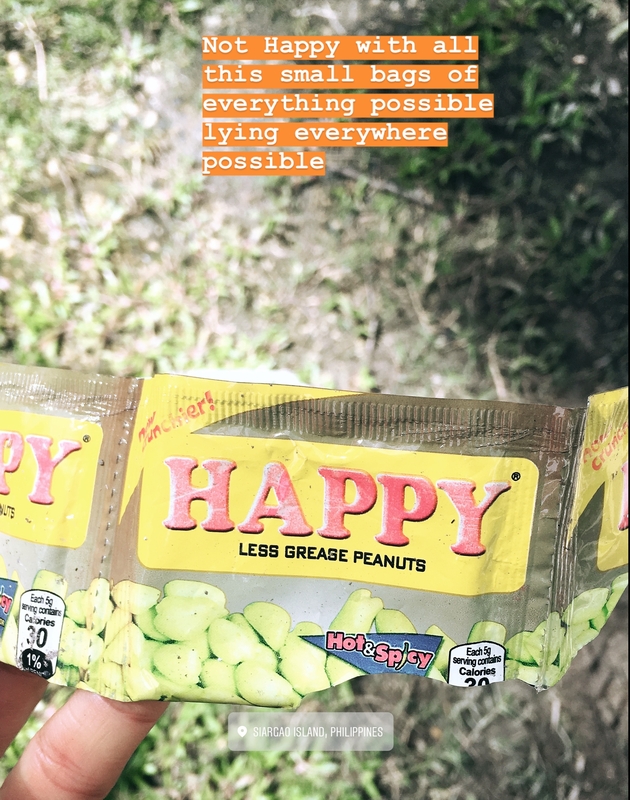 But I had to put it out there in a hope that it will reach and inspire somebody to try their best while traveling, either to Philippines, South East Asia or any other place on Earth. If you have any questions feel free to send me an email to info@chickita.si or leave a comment.